MELVILLE, N.Y., May 31, 2017 – Canon U.S.A., Inc., a leader in digital imaging solutions, today announced the Canon EOS C200 and Canon EOS C200B Digital Cinema Cameras, the latest additions to its acclaimed Cinema EOS line of professional cinema cameras. Designed to meet the demanding needs of filmmakers and TV production users, the new Canon cinema offerings will combine the ease of use of entry level cinema cameras with exciting new, high-end features that are ideal for cinema, documentary, wildlife, wedding and events productions. Representing the third generation of the Cinema EOS system, the Canon EOS C200 and Canon EOS C200B Digital Cinema Cameras feature the latest in Canon technologies and offer two 4K video formats, Canon’s new Cinema RAW Light and MP4, optimized for those interested in recording beautiful HDR video. Alongside a newly developed dual DIGIC DV6 image processing system, Canon’s celebrated Dual Pixel CMOS AF system and improved operability for professionals, these new products are capable of capturing stunning 4K video across a variety of production applications. Based on feedback from Cinema EOS users, this new offering will be available in two configurations, while retaining the same core technologies within. The Canon EOS C200 Digital Cinema Camera is a production-ready solution that can be used right out of the box, accompanied by an LCD Monitor, LCD Attachment, Camera Grip and Handle Unit. The camera also features a 1.77 million dot OLED Electronic View Finder (EVF). 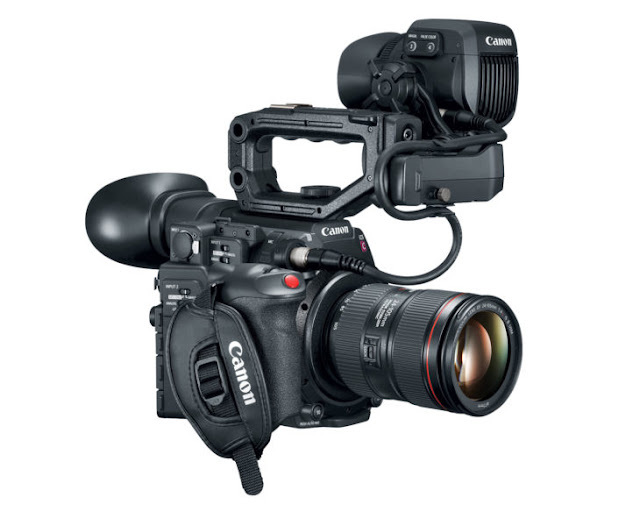 For users who crave more versatility and the ability to craft custom setups tailored to their subject or environment, the Canon EOS C200B Digital Cinema Camera offers cinematographers the same camera without these accessories and the EVF to optimize shooting using a gimbal, drone or a variety of other configurations. The Canon EOS C200 and Canon EOS C200B Digital Cinema Cameras sport the same 8.85MP CMOS sensor, that combines with a newly developed dual DIGIC DV6 image processing system to help process high-resolution image data and record video from Full HD (1920×1080) and 2K (2048×1080) to 4K UHD (3840×2160) and 4K DCI (4096×2160). A core staple of the third generation Cinema EOS System, this new processing platform offers wide-ranging expressive capabilities and improved operation when capturing high-quality HDR video. The combination of sensor and newly developed processing system also allows for the support for two new 4K file formats designed to help optimize workflow and make 4K and HDR recording more accessible to filmmakers. Cinema RAW Light, available in 4K 60p/50p at 10 bit and 30p/25p/24p at 12 bit, allows users to record data internally to a CFastTM card by cutting data size to about one-third to one-fifth of a Cinema RAW file, without losing grading flexibility. Due to the reduced file size, users will appreciate rich dynamic range and easier post processing without sacrificing true 4K quality. Alongside recording to a CFastTM card, proxy data (MP4) can also be simultaneously recorded to an SD card for use in offline editing. Additionally, filmmakers will also be able to export 4K in MP4 format on versatile SD media cards at 60/50/30/25/24P at 8 bit. Support for UHD recording allows for use in cinema and broadcasting applications or scenarios where long recording times are needed while still maintaining top image quality. The digital cinema cameras also offer slow motion Full HD recording support at up to 120fps to help ensure every frame is captured in exquisite detail. The Canon EOS C200and Canon EOS C200B Digital Cinema Cameras feature Innovative Focus Control that helps assist with 4K shooting that demands precise focusing, whether from single or remote operation. Canon’s acclaimed Dual Pixel CMOS AF technology helps to expand the distance of the subject area to enable faster focus during 4K video recording. This also allows for highly accurate continuous AF and face detection AF when using EF lenses. For 4K video opportunities that call for precise focus accuracy that can’t be checked on an HD monitor, users can also take advantage of the LCD Monitor LM-V1 (supplied with the EOS C200 camera), which provides intuitive touch focusing support to help filmmakers achieve sophisticated focusing even as a single operator. Editing and grading of Cinema RAW Light video format will be supported in DaVinci Resolve of Blackmagic Design. Editing will also be possible in Media Composer® from Avid Technology®, using Canon RAW Plugin for Avid Media Access®. *1 This format can also be processed using a Canon application, Cinema RAW Development. *2 Demonstrations using these software programs will be given at the 2017 Cine Gear Expo June 1st-4th in Hollywood, CA. Furthermore, Premiere Pro CC of Adobe® Systems will support this format until the end of 2017. Editing will also be possible in Final Cut Pro® X from Apple®, using Canon RAW Plugin for Final Cut Pro X®. *3 after second half of this year. The Canon EOS C200 and EOS C200B Digital Cinema Cameras are scheduled to be available in August 2017 for estimated retail prices of $7,499** and $5,999** respectively. The EOS C200 comes equipped with additional accessories including the LM-V1 LCD Monitor, LA-V1 LCD Attachment, GR-V1 Camera Grip and HDU-2 Handle Unit. These accessories will also be sold separately and available in September 2017. An ideal complement for the EOS C200 Cinema Camera is the recently announced COMPACT-SERVO 70-200mm Zoom Lens. The lens is scheduled to be available later in 2017, for an estimated retail price of $5800. When Is The Canon Super Zoom Lens Coming?